Exam dates for Miscellaneous Service Recruitment 2011 (Preliminary) is been declared. 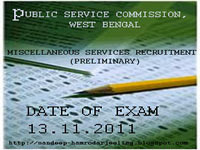 [conducted by Union Public Service Commission (UPSC) West Bengal. ].Admit cards are issued.